Is it a techno-socialist utopia, or a bureaucratic nightmare ? For now I’ll leave that up to you, dear reader, but provide some illustrations as to how I use Trello in order to collaborate with teams on projects, making decision making easier and more transparent, and keeping myself well organised and on track. This is by no means a full tutorial, but just some highlights worth pointing out. Its satisfyingly user-friendly software that can be accessed in your browser as well as desktop and mobile apps. So jump in and give it a go – here’s a link to the example board. Clicking on any of the ‘cards’ or tasks will open a window that shows more detailed information. Export a snapshot of the board as a CSV for use as a contract, or to migrate to another service. Use Zapier or IFTT to connect your board with any other online service! If you liked this introduction and you want to find out more please contact me to request an invite. By requesting an invitation from myself you’ll help me cover the paid features of using this app. Do you have alternative tools you use to manage projects? 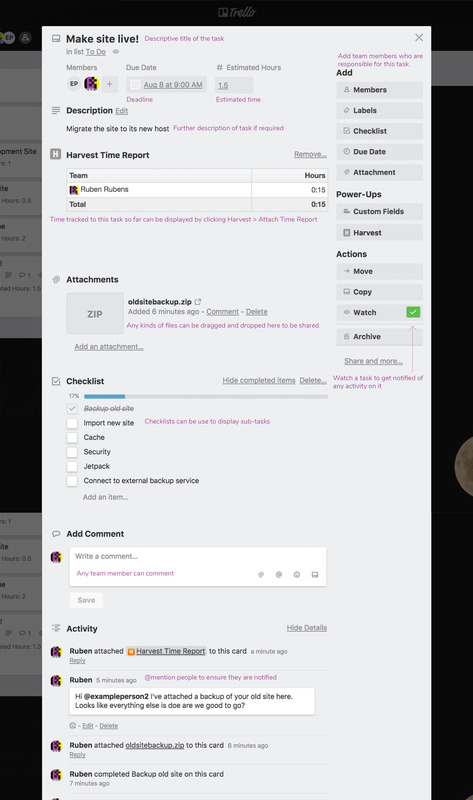 Do you use Trello but with a different workflow? Are you stuck and need a tip? Leave a comment below!